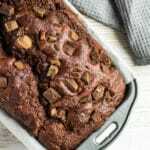 Double Chocolate Banana Bread – Deliciously moist and fluffy banana bread that is loaded with chocolate flavour, and stuffed full of chocolate chunks. 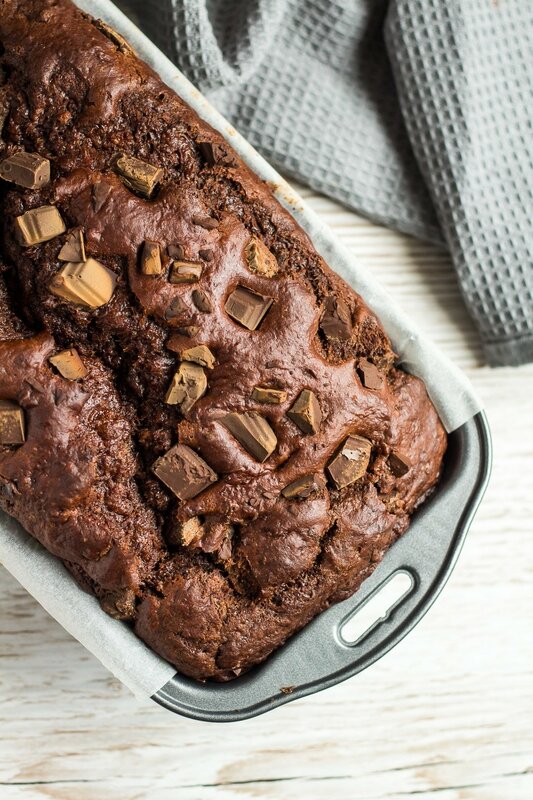 This is the ultimate banana bread for chocolate lovers! 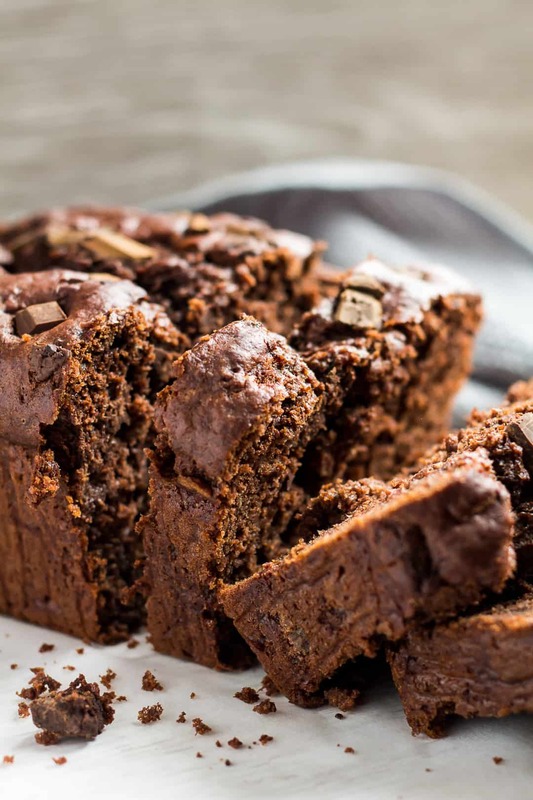 This bread is loaded with flavour from both the bananas and chocolate. It is incredibly moist, and is a mix between fluffy and dense. 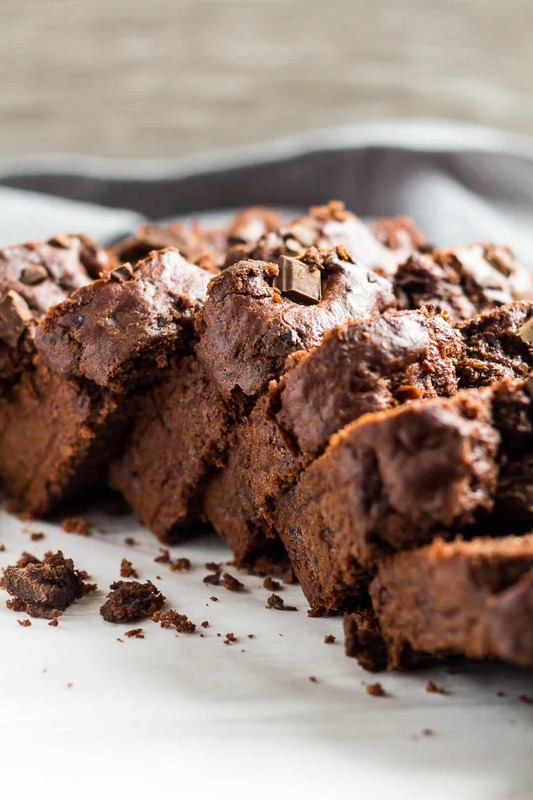 Throw in some chocolate chips or chunks for the ultimate chocolate lover’s bread. 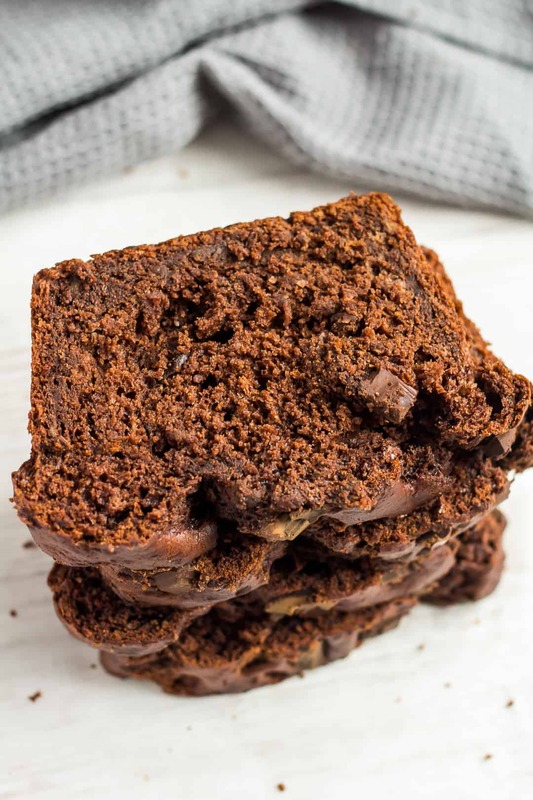 Seriously, if you love banana bread and chocolate, you are gonna LOVE this quick bread recipe. This banana bread is super quick and easy to throw together – no mixer required. Simply grab a couple of mixing bowls and a spatula, and you’re ready to go! Simple, basic ingredients that you probably already have at home! To make this banana bread recipe, simply whisk together the dry ingredients (including chocolate chunks) in one bowl, and the wet ingredients in another. Combine the two mixtures together (avoid over-mixing), then pour into a loaf pan lined with parchment paper or foil. Top with extra chocolate chunks if desired! Bake for about 50 – 60 minutes or until a toothpick inserted into the centre comes out clean with a few moist crumbs. You may want to cover the loaf with foil halfway through baking to prevent it from browning too much. Have some chocolate banana bread leftover? You can keep in an airtight container at room temperature or in the fridge for up to 5 days. You can also freeze it for up to 3 months! Whenever I crave a slice or two, I like to warm mine up in the microwave for a few seconds… warm, melt-y chocolate perfection. Try these delicious bread recipes next! 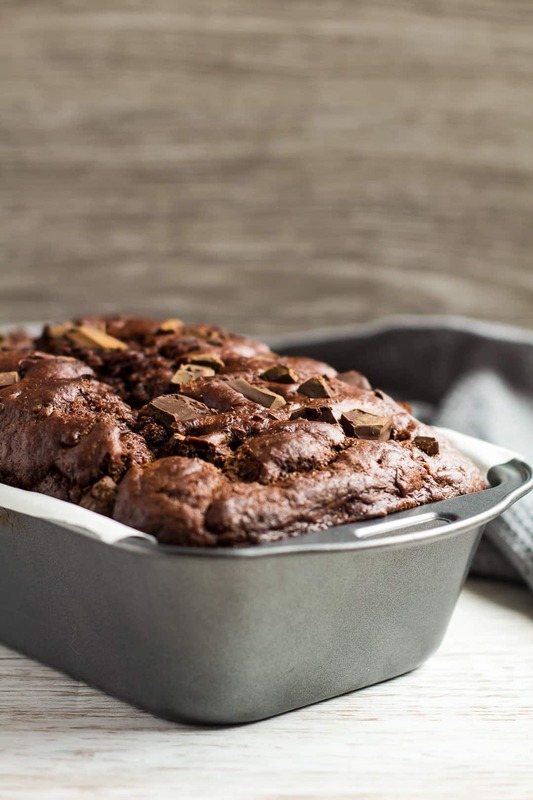 Deliciously moist and fluffy banana bread that is loaded with chocolate flavour, and stuffed full of chocolate chunks. This is the ultimate banana bread for chocolate lovers! Preheat the oven to 180C/350F/Gas 4. Grease a 9x5-inch loaf pan, line with parchment paper or foil, and set aside. Whisk together the flour, cocoa powder, sugar, baking powder, baking soda, and salt. Toss in the chocolate chips. Set aside. Whisk together the egg, banana, vanilla, vegetable oil, and yogurt. Pour the wet ingredients into the dry ingredients, and mix until just combined. The batter will be quite thick. Pour the batter into the prepared pan and spread out evenly. Bake for 50 - 60 minutes, or until a toothpick inserted into the centre comes out clean. Cover loosely with aluminium foil halfway through baking to prevent the bread from browning too much. Leave to cool completely in the pan on a wire rack. Allow to cool completely in the pan on a wire rack before slicing and serving. Bread stays fresh in an air-tight container at room temperature or in the fridge for up to 5 days. It also freezes well for up to 3 months. Thaw overnight in the fridge. This was first posted on Julie’s Eats & Treats, where I am a contributor. Yum! Now this is my kind of banana bread! I believe my grandson would love the Double Chocolate Banana Bread. Could I substitute milk for the greek yogurt? My grandson has a deadly dairy allergy and cannot yogurt. I want to substitute with soy milk. Is that possible or what do you suggest………..maybe just leaving out the yogurt. You can certainly use soy milk instead of yogurt.